In the county of Antigonish there is a place called Caledonia Mills. Alexander and Mary MacDonald and their 16 year-old adopted daughter Mary-Ellen lived in a farm house in this small community. In January of 1922, a fire started in part of their house. Oddly it was not near their fireplace or wood stove. Once extinguished another erupted in an empty room at the other end of the home. The family was totally puzzled. Other fires materialized mysteriously. Wet towels and the patches of wallpaper would burst into flames. It did not take the family long to realize that there was something unnatural occurring. With the help of their neighbors they began to guard the house, hoping to catch an intruding arsonist. Fires continued to appear out of nowhere, but no arsonist was ever caught. In total there were 30 unexplained fires. Fires were not the only unsolved occurrence at the farm. The MacDonalds would enter their barn to find ashes in the stored milk and all the animals moved to different locations within the barn. Soon the family was persuaded to leave the home while the local authorities investigated. When word of the mysteries got out reporters arrived to get the scoop. Even Sir Arthur Conan Doyle was invited to investigate. 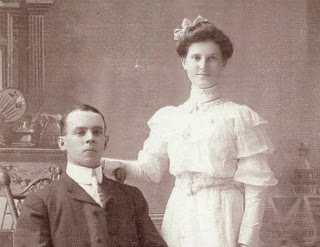 The MacDonald's daughter Mary-Ellen, came to be known as “Mary-Ellen Spook”. She moved to Central Canada and no further incidents occurred.